John Barrow and Nancy Davenport are my 4x great grandparents, the parents of my 3x great grandmother Henrietta Barrow. John Barrow was born September 26, 1801 in Kentucky. He is the son of Aaron Barrow and Martha Tatum. Nancy Davenport was born on December 3, 1802 in Kentucky. She is the daughter of John Davenport and Sarah Elder. 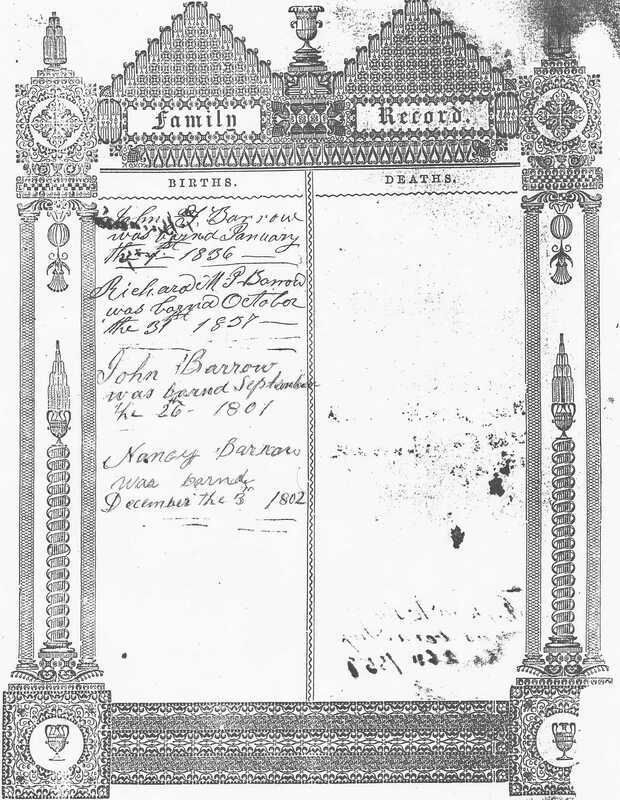 John Barrow married Nancy Davenport on October 15, 1822 in Casey County, Kentucky. They would have 8 children, and 3 of them married Hoppers. 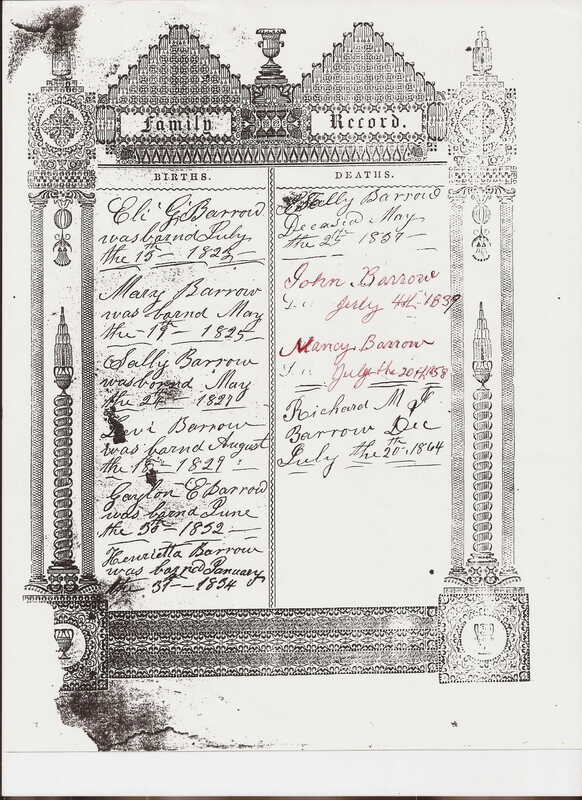 Barrow Family Bible, shared with permission by Marion Hopper (m13hopper@gmail.com). On the 1830 US Census, John Barrow was head of a household in Pulaski, Kentucky. Living the house were: 1 male under age 5 (Levi was 1), 1 male ages 5-9 (Eli was 7), 1 male age 20-29 (John was 29); 1 female under age 5 (Mary was 5), 1 female age 20-29 (Nancy was 28). The family enumerated just before them is John’s father Aaron Barrow. John is said to have died on December 4, 1839 in Pulaski County, Kentucky. He was 38. His Find A Grave memorial is here but it shows him dying July 4, 1859. On the 1840 US Census, Nancy Barrow was listed as head-of-household in Pulaski County, Kentucky. Her household included 2 males under age 5 (John was 4 and Richard was 3), 2 males between ages 5 & 10 (Levi was 11, Galen was 8), 1 male age 15 to 20 (Eli was 17), 1 female under age 5 (Henrietta was 6), 1 female between ages 10 and 15 (Mary was 15), and 1 female between ages 30 & 40 (Nancy was 38). On the 1850 US Census, Nancy Barrow was 42, so she aged only 4 years in 10 years. She was still in Pulaski County, Kentucky. Eli was 27, Levi was 21, Galen was 19, Henrietta was 17, Thompson was 15 and Johnson was 11. A presumed grandson, Erasmus, age 7, was also in the home. In approximately 1851 Nancy moved the family to Illinois. Nancy is said to have died on July 20, 1858 in Greene County, Illinois. She was 55. Her Find A Grave memorial is here. Eli G. Barrow – Eli was born July 13, 1823. He married Mary Ann Barnard on August 24, 1858 in Greene County, Illinois. He was found in Mount Airy, Greene County, Illinois on the 1860 US Census, at age 27 with his wife age 16. He registered for the Civil War draft in Greene County, Illinois in June of 1863 when he was 37 years old. By the 1870 US Census he had died, and his wife Mary was found in Greene County, Illinois with two children. Margaret age 4 & Robert age 1. Mary Barrow – Mary was born May 19, 1825 in Wolf Creek, Pulaski County, Kentucky. She married Theophilus Hopper on September 21, 1848 in Pulaski, Kentucky. They had 3 children. She died on August 29, 1897 in Harrison County, Missouri. She was 72. Her Find A Grave memorial is here. Sally Barrow – Sally was born May 24, 1827. She died on May 25, 1837 at age 10. Levi Barrow – Levi was born August 18, 1829 in Wolf Creek, Pulaski County, Kentucky. He married Sophronia Hopper Holbrook on March 3, 1857 in Greene County, Illinois. They had 4 children. He died January 11, 1889 in Athensville, Greene County, Illinois. He was 59. His Find A Grave memorial is here. Gaylon Evan Barrow – Gaylon was born June 30, 1832 in Pulaski County, Kentucky. He married Emeline Eastham on August 23, 1855 in Pulaski County, Kentucky. They had 2 children. Gaylon served in the 3rd Regiment of the Kentucky Infantry in the Civil War, on the Union side. He likely died in the war. Henrietta Barrow – My 3X great grandmother Henrietta was born January 31, 1834 near Wolf Creek, Pulaski County, Kentucky. She married Joshua Hopper on December 5, 1854 in Greene County, Illinois. They had 2 children. Around 1866 she married widowed John Laws. They had 2 children. Henrietta died in 1902 in Alpena, Boone County, Arkanas. She was 68. She is buried by her second husband John Laws in the Mincy Cemetery, Mincy, Taney County, Missouri. Her Find A Grave memorial is here. Read about her here. John Thompson Barrow – John was born January 1, 1836. He married Katura P. Hart on July 25, 1867 in Jackson County, Missouri. They had 2 children. He married Anna Eliza Etheridge in Jackson County, Missouri on September 25, 1879. He is listed as an early member of the Church of Jesus Christ of Latter Day Saints. He died in October 1922 in Jackson County, Missouri. He was 86. His son Richard Edwin Barrow was the informant for the Missouri Death Certificate, which lists his middle name as Thomas instead of Thompson. It also lists John’s grandfather Aaron Barrow as his father, and John’s first wife Katura Hart Barrow as his mother. His Find A Grave memorial is here. Richard M. “Johnson” Barrow – Johnson was born on October 31, 1837 in Pulaski County, Kentucky. He never married. He died fighting in the Civil War, in Davidson County, Tennessee on July 20, 1864. He was 26. His Find A Grave memorial is here. This entry was posted in Hopper Family History and tagged Aaron Barrow, Anna Eliza Etheridge, Eli G. Barrow, Emeline Eastham, Erasmus Barrow, Galen Evan Barrow, Henrietta Barrow, John Barrow, John Davenport, John Thompson Barrow, Katura Hart, Levi Barrow, Martha Tatum, Mary Ann Barnard, Mary Barrow, Nancy Davenport, Richard M. Johnson Barrow, Sally Barrow, Sarah Elder, Sophronia Hopper, Theophilus Hopper by fillinginthefamilytree.com. Bookmark the permalink.